Going through a breakup while in a long distance relationship can be very difficult to cope with; the distance that separates you from your ex either during the actual separation or in the days and weeks that follow can make it even more excruciating. No breakup is easy but the feeling of being physically far away from the person that you love and knowing that they are no longer yours can make some of the negative emotions even more intense. You must realize that all hope is not lost after a long distance break up and that in general it is possible to get back with your ex following a long distance relationship. This process can be a bit more difficult than if you had the opportunity to still interact with him or her face to face; however it is important for you to know that if you put the right actions in place and if you are in the right frame of mind, you can get back with your ex following a long distance relationship. My passion and full time job as a coach specialized in helping people get back with their ex is to provide you with tangible solutions that you can implement right away in your daily life! I have garned considerable experience while helping people from all over the world, and this article will showcase what you can do to make things right when coming out of a long distance relationship! Many times people associate their sadness or state of depression with the fact that they have lost someone that was dear to them. It is therefore easy to believe that you will suddenly feel better and be in a happier place as soon as you will be able to get them back into your life. This preconceived idea leads people to approach the process of getting back with an ex following a long distance relationship in the wrong way! The truth is that you must first feel better about yourself and start to have a more positive outlook before you can get them back into your life. No one wants to be seduced or won back by someone that is depressed and needy. You must display enthusiasm, have energy and interesting projects in order to make your ex reconsider their decision to breakup. So your first actions should not be geared towards your ex but rather towards yourself in order to figure out the best way for you to get out of this funk on your own, completely independently from your ex! The best way to accomplish that is to be active, to set daily goals for yourself and to continuously push your comfort zone when socializing with friends or by forcing yourself to meet new people. You will also need to start to analyze the mistakes that were made after breaking up long distance. It can be done while looking into ways to snap out of the state of depression that you may find yourself in, and after having mentally processed that your overall well-being as nothing to do with the process of getting back with your ex. Long distance relationships can be challenging waters to navigate for anyone, mainly because you need to find ways to maintain intimacy and a healthy balance with your significant other while not being physically together. My ex boyfriend apologized but should I take him back? The three most common mistakes made during long distance relationships are the following: The first is not having an end date in sight regarding when you will once again be together permanently. This can put a lot of pressure on both parties because it can feel like the long distance is everlasting. It is important to have an end in sight as a commitment to each other; and to have a common goal that you are building towards. The second mistakes that many people make is being too needy or jealous which ends up pushing your partner away. You too may have asked a million and one question every time your ex goes out, and genuine interest in what your partner is doing can quickly turn into obsession and a feeling of being controlled by the other party. The last mistake that I commonly encounter is not being able to manage the transition period following a long distance relationship; when two people actually have to be together and share a living space. Being in a long distance relationship is one thing; seeing your partner day in and day out is another! Regardless, if you went through a breakup it means that you most likely made mistakes. If you are truly hoping to get back with your ex after a long distance relationship, you will need to identify the mistakes that you’ve made and come up with tangible solutions to make things right. It is the only way to truly be in the best possible circumstances to prove to an that you can make them happy! You have to be willing to do the work in order to showcase a new found perspective! Through your actions you can in fact that past issue can be overcome and that you can be happy together as a couple. In most cases long distance relationships that don’t end up working out can still be salvaged, because i often only takes a compromise or two to make things work. That’s why I urge you to reach out to me if you haven’t done so already in order for us to work together. Why not taken advantage of my expertise and success and work with a relationship expert to make things work in your love life? I’ve seen some relationships where all that needed to be done was making a commitment to spend more time together in order for the relationship not to run out of steam! This is especially true for long distance relationships that drag out over a very long period of time or when the couple can only come together a couple times per year on average. Other long distance relationships are a lot more difficult to salvage. For instance when two people are entrenched in their respective communities for example or when their professional aspirations and their relationship can’t seem to align. The love that you may have for one another may push you both to stay together longer than you really should; but in the end it takes a major compromise from one of you to really make things work. The person making the sacrifice also needs to make it willingly and truly accept what they will be giving up. Because if they don’t it can lead to resentment as soon as certain issues arise in the relationship. The person making the compromises can often feel that their counterpart is not willing to make sacrifices of their own for the relationship. Is wishing my ex a happy birthday really necessary? So make sure that you take some time to ask yourself the right questions and to see if you are really willing to make the necessary compromises to enable your relationship to truly flourish. Long distance relationships are peculiar because it is very easy to fall out of touch with your ex. It is therefore very important to make considerable efforts to stay in touch with your ex immediately following a long distance relationship breakup. The trick will be to ensure that are not being too needy by not looking to convince your ex to get back together every time you speak to one another. Although it can be difficult and even painful to stay in touch with your ex following a long distance relationship, it is absolutely crucial in your quest to get back together. You will use these interactions to showcase your change and to prove how attractive you can be. 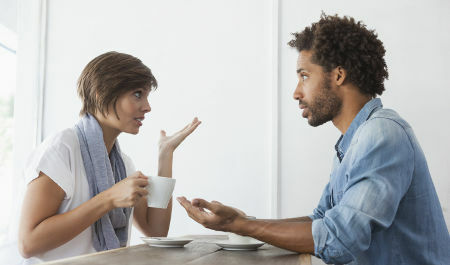 Know that as long as you maintain a healthy dialogue with your ex, you will have the opportunity to seduce them again or get back together down the road; but it all starts with your ability to speak to them on a somewhat regular basis, without being too pushy or emotional. In order to get back together you will need to see your ex face to face. It is in fact impossible to seal the deal and get back into a relationship from distance, over the phone or on skype! It is important for you to know and understand this concept because it will enable you to plan accordingly and look to organize a way for you to see each other after a long distance breakup. If possible, it is best to meet in on neutral grounds, not in your city or theirs. This will reinforce the notion of change that you will have been working to showcase. Furthermore it will enable you to create new energies or a new dynamic instead of finding yourself in the same place; which could lead one or both of you to associate past issues to the current outlook. If it impossible to meet in a neutral environment, it’s best for you to go to their city in most cases or within your ex’s comfort zone rather than the other way around. This will make it easier for you to be in the right environment to get back with your ex. During this face to face period or date, be prepared to reinforce this notion of change to your ex. Make them feel like you have really changed and that you can make them happy! If you are successful in conveying a future where both of you can be happy together, with an end in sight to the long distance aspect of your relationship, we are convinced that you will be able to get back with your ex!